Pulling off a site that features a dark layout that you want to look elegant and sophisticated can be a tough thing to get just right. If you’re not careful, it’s easy for your site to come across feeling very heavy and dark. However, if you get it just right, you can end up with a beautifully rich look and feel that has an incredibly high-end appeal to it. Midnight premium WordPress theme by StudioPress is one of those themes that gets it just right, and the result is absolutely incredible. The color palette is incredibly simple with a deep, black background working as a great contrast for ligher grays and whites in your text and element accents. 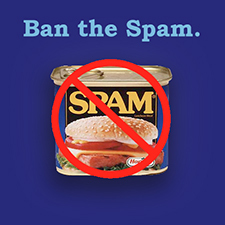 The inclusion of a color here or there for special elements such as links results in a site that is simply stunning. If you’re interested in learning more about Midnight premium theme, read on to see some of the features offered up by this great template. The vivid contrast achieved through Midnight’s design lends an extremely compelling feel to your site, with its great magazine style features that are all built upon StudioPress’ rock-solid framework. And it’s because of that great framework that you’re afforded plenty of options to customize your theme exactly as you want, such as multiple page layouts, custom backgrounds, and custom headers. All of these options make it easy to use Midnight for everything from an upscale magazine, to a simple, stylish blog about fashion, jewelry, or the latest celebrity gossip. 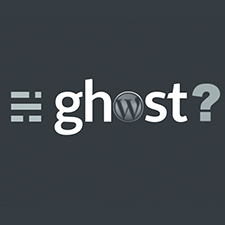 If you’ve never worked with WordPress before, you should know that it’s quite simply one of the easiest content management platforms to setup for use on your site. With a little bit of elbow grease and a willingness to roll up your sleeves and get your hands dirty, you can have a site up and running in no time. 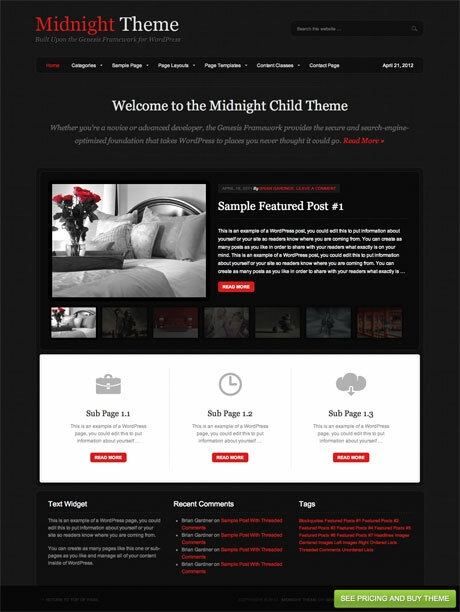 Once that is in place, you’ll simply drop the Midnight premium WordPress theme in your included “themes” folder. After it has been activated, all you have to do is go to town selecting the options you want for your site! If all of that sounds a little bit daunting, you won’t have to worry about doing it alone as all StudioPress theme purchases come with unlimited support and access to detailed tutorials to help you through any snags you might have hit along the way. Midnight premium WordPress theme is an excellent template to choose if you’re looking for something that breaks away from the typical grayscale look of most WordPress themes. The feature list below outlines some of what’s available to you with Midnight premium theme and the live demo at the end of the post will take you to a page to see the theme in action. Hopefully Midnight fits the bill for what you’ve been looking for lately!